What’s yellow and hangs from the ceiling? If you remember elephant jokes you probably also know that what’s yellow and hangs from the ceiling is a yellow ceiling-hanger. What’s red and hangs from the ceiling? That’s right. It’s a red ceiling-hanger? And what’s blue and hangs from the ceiling? No. Ceiling-hangers only come in red and yellow. And taxicabs only come in yellow in most cities. But not in Bangkok. 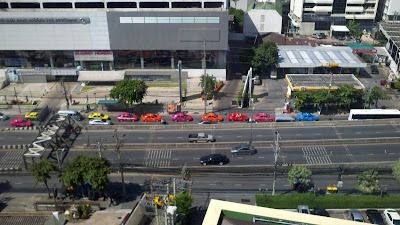 I was glancing out the hotel room window and saw this line of taxis waiting for a light to change. This is not the full range of taxi colors here. There are others, including chartreuse. I stepped out of the hotel’s front door and looked up. 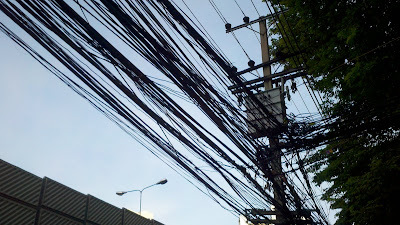 I assume these are telephone wires, but I am at a loss to explain why they are managed, if that’s the right word, in this fashion. 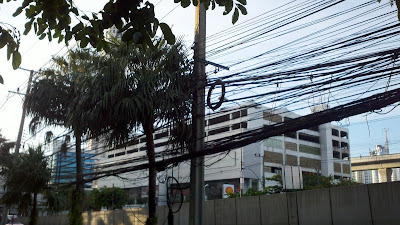 Those are a combination of electrical and telephone wires. 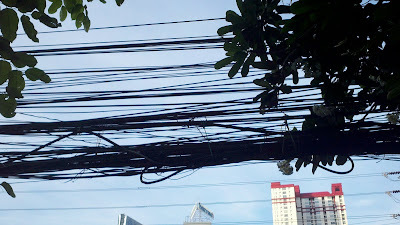 This is how electric companies lay their wires around the cities in South East Asian countries.